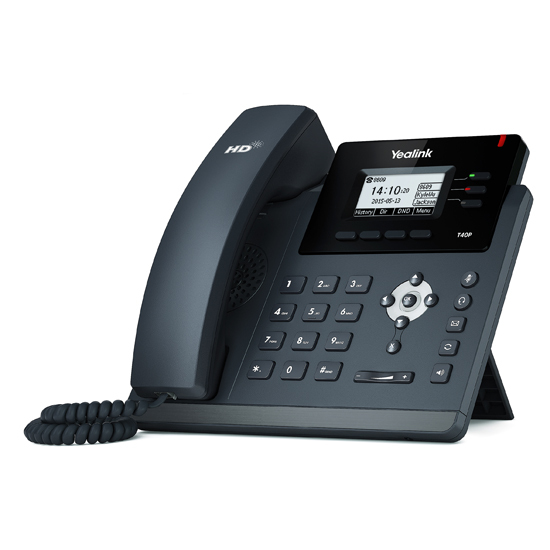 The new SIP-T40P from Yealink features high-quality audio and an easy to install VoIP phone. Yealink Yealink’s newest SIP T40P is ideal for call centers, call shop and open-plan offices with easy installation and enhanced security protocol. Three SIP lines keys, programmable dual LED buttons 802.11af Power over, Dual Ethernet Port, offers Optima HD Voice, EHS support for wireless JPL X-400, Plantronics or Jabra DECT headset makes the phone to an affordable functional phone with high demands on design and simple, secure voice encryption, making it perfect for small to medium-sized enterprises. All these essential features with high-end functionality and cost-effective VoIP telephony makes it easy for any business to a simple telephony. This phone is compatible with standards-based phone systems such as Asterisk 3CX, Askozia and pascom mobydick and other SIP-based hosted server. Learn about new Yealink SIP phones by contacting VoIPDistri.com European VoIP Warehouse by phone: (49) 5201 to 730030 or email: info (at) VoIPDistri (dot) com. VoIPdistri.com Voice over IP Warehouse is the leading specialist reseller of VoIP phones, phone systems, conference systems and network devices. We deliver to small businesses and SME companies to provide reliable VoIP and network solutions, we have everything in stock. Our trained customer service team (no call center) makes professional customer service to our entire range of telecommunications and support them in any problem.